Alright, I did promise some exciting blog posts after the long weekend. I know this topic is probably only exciting for my little family, but I’m going to make a big deal of it anyway. Just over a week ago, Savanna started crawling. Now she’s pulling herself up to stand! I really wasn’t ready for this. I thought she’d spend more time just crawling around, but she seems to be in a hurry to grow. She’s been trying for a couple of days to pull herself up, but her legs weren’t strong enough to support her body. But this all changed today. 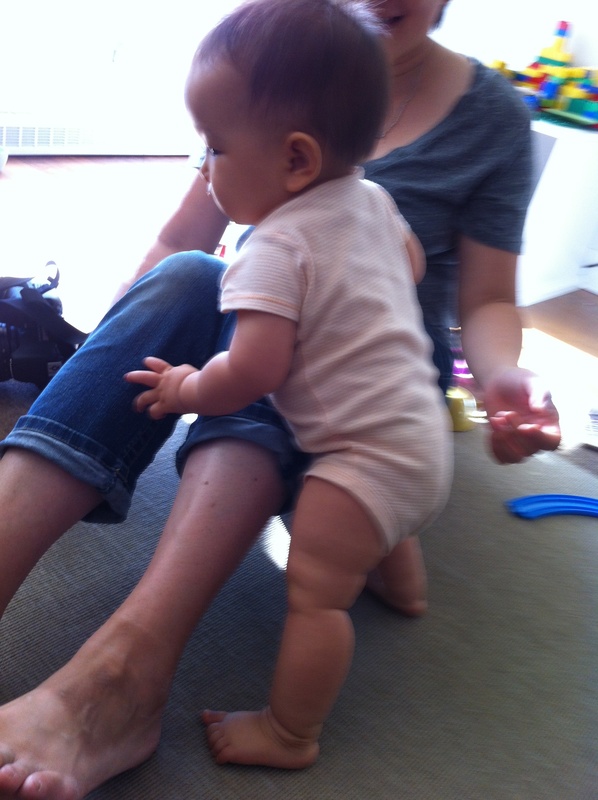 She crawled up to me, hung onto my knees, and pulled herself up to a standing position. I remember that before I had kids, some of my mommy friends would tell me little milestones in their kids’ lives, and I would always wonder why they make a big deal of nothing. Aren’t kids supposed to grow? Aren’t they supposed to crawl and walk and poop in the potty? Now I am totally one of those mommies. This entry was posted in Family and tagged development, growth, Savanna, standing by angelasaito. Bookmark the permalink. I look forward to the day when Sebastien does the same…and talk…and walk… and can put his soother back in by himself… feed himself….